Once again, it’s time for quarterly service changes, where adjustments to route and time connections are made to make the system easier to operate and use. 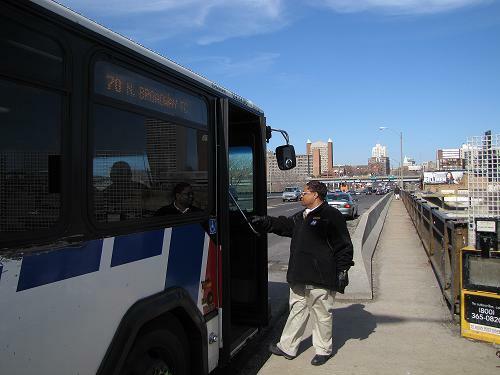 MetroBus quarterly service changes will go into affect on Monday, March 14. The changes may be minor in some instances, but they affect many routes and could make the difference on whether you make or miss your bus! Please take the time to review your routes for any time or route changes, particularly to the #70 Grand, #58X Twin Oaks, and #410X Eureka Express affected by the Grand Bridge Construction, and significant changes made to the #47 North Hanley, #49 North Lindbergh, and #57X Clayton Road. All changes are currently available on Google Maps and Google Maps smart phone apps. #4 Natural Bridge Time adjustments only. #17 Oakville Time adjustments between South County Mall and Baumgartner. The Sylvan Springs Park Ride Lot will no longer be served due to low usage. #35 Rock Road Time adjustments only. #44 Hazelwood Trip time and time adjustments. #46 Tesson Ferry Time adjustments only. * Schedule and time adjustments along the entire route, rush hour service will operate every 24 and 36 minutes in order to provide timed connections at Clayton and North Hanley MetroLink Stations. Weekday off-peak and Saturday trips will operate a 40, 40, 60, 40, 40, 60-minute service. * Time adjustments between Ballas Transit Center and JCC. Southbound trips will no longer serve the cut-off at Chaminade Drive. Customers would board the bus on Lindbergh at Chaminade Drive. #61 Chambers Road Time adjustments only. * Route and schedule adjustments on account of the Grand Bridge re-construction project. * Initially, for about two weeks, when the demolition of the Grand Bridge and elevators on the MetroLink platform take place, the #70 Grand will be re-routed to the Union Station MetroLink. The schedules, maps and turning directions at the links below display information on this temporary reroute. * The route will continue to serve the Grand MetroLink Station from Scott Avenue after this temporary re-route. The Schedules, maps and turning directions will be made available on this page in advance of the change. #73 Carondelet Time adjustments only. #75 Lilac Hanley Time adjustments only. #95 Kingshighway Time adjustments only. #97 Delmar Time adjustments only. * Per customer request, the routing will be changed to continue on Clayton Rd in both directions west of Kehrs Mill Road. Service will no longer be provided along Kehrs Mill Road and Clarkson Road. * The route will not serve the Grand Metrolink Station for the duration of the project. * The route will proceed on Grand, Chouteau, Compton and Market in both directions. #258 Clayton – Chesterfield Time adjustments only. I suggested that the #410X Eureka Express begin service at the 141 Park ‘n’ Ride lot 20 to 30 minutes prior to the times at the Route 66 Park ‘n’ Ride lot heading west in the morning. But I wonder if Planning must be afraid that they might get sued by the drivers for privacy violations if they did. But I don’t care! Passengers are urgent. I suggested an extention of service to the Museum of Transport. But nobody listened! There are STILL some parts of Barrett Station Road that is dangerous and same with Big Bend west of I-270. I’m wondering why the 58X was routed along Market instead of Olive. A sizeable contingent of SLU folks used to get on at Lindell and Grand. A stop along Compton near Chaifetz Arena would be great, but there’s no opportunity for people on the North Campus at SLU now to take the 401X or the 58X without adding an extra 20-30 minutes to the commute, which completely defeats the purpose of having express service at all. It’s back to the car, I suppose. It helps to pinpoint certain routes that lack schedules? Have you noticed no schedules on #11 Chippewa? There are rarely schedules for the 95 on the 95. I can tell you, for routes that I ride occasionally – the schedules available on the bus RARELY (at least when I have ridden) matched the route number. Routes are 44, 45, 32, 57, 56, 73, 10, 59, 90. Might be that there were multiple schedules on the bus and I just happened to choose the rack with the incorrect schedule, but I don’t rely on the schedules on board because they are usually wrong. When will Metro be updating their website with the new schedules related to the Grand shutdown? The changes begin Monday and you still have the Aug. 2010 schedules posted. It’s a little difficult to make plans for the route changes without the new schedules available. Another classic Metrolink move. You can access the new timetables under Plan Your Trip/Service Updates here, or you can use Google Transit and a date March 14 or later to plan your trip. The route pages will update on Monday. Metro suggested offering seminars to educate the public on how to use public transit, specifically their buses. It appears Metro should allow some of their personnel to attend these seminars so they can be educated on how to properly and promptly get information on these quarterly schedule changes, and other service changes, out to the public, other than through the use of the website. That may cut down on some of the confusion. I would like an explanation as to why my e-mail address will not be published. I have not in any way offended anybody or said anything derogatory about anyone in any of my comments. My comments have been constructive and professional. You shouldn’t let your personal feelings interfere with my right to express my feelings in my comments, and not have them posted in Metro’s blogs. I thought the blog was suppose to be set up as an open forum. I feel like you are unjustly discriminating against me, and not what I stand for. If I don’t hear from you , I will contact your superiors, even if I have to contact Mr. Nations. I have not done anything to hide your email address; we are in the process of changing the WordPress theme for the blog, and the default theme appears to not be displaying the addresses, though administrators of the blog can see them. You have been commenting on this blog long enough to know that we do encourage open discussion, as long as the language is not inflammatory or terribly off-topic. I hope this clarifies this issue for you; please let me know if it has not. You can also contact me personally. I misunderstood or possibly misread the message on the website. When I attempted to send my last comment, there was a message that followed at the bottom that stated “Your email address will not be published. Required fields are marked”. I double-checked and made sure I correctly made all of the required entries to enter the website and that message continued to show. Thank you Courtney for clarifying this matter and I want to take the time to offer my personal apologies for the misunderstanding. The maps at all the stations and including the airport have NEVER been changed. They still have the March 2009 maps and not an upgraded map. Is it that the federal government won’t let Metro put up the new ones because of 9/11? PLEASE CHANGE THOSE MAPS AT THE AIRPORT AND AT THE METROLINK STATIONS!!! For the next service change comming this summer, make sure that the Affton shuttle has more runs so people can ride it to Grant’s farm and residents in Affton can have a ride to Johnny’s Market and to Steak ‘n’ Shake! I learned yesterday Patrick that we are in the process of updating the maps at MetroLink stations, so that should be good news! Thank you for your comment, Denniskh2. Several commenters have mentioned that scheduled information on buses is a problem, and I will talk to scheduling and bus operations about what can be done to increase information. We are looking into other means of relaying schedule information, such as text-based delivery. We do appreciate your thoughts, and I assure you I will continue them on to the necessary Metro employees. Im sorry for the incorrect grammer…On line 5…it should be “smartphones”, and on line 6 it should read closed. On line 7 it should be platforms. thanx again. As I rode the #56 today coming home from the Shrewsbury station, I saw something that made me scratch my head. There was some time adjustments to relieve overcrowding on the #34 at 8:10 AM! Now that is NOT going to relieve overcrowding! There is a articulated bus sitting in the Illinois shop with nothing to do. It would have made more sense to get out the articulated bus and put it onto the run that leaves at 8:10 out of the North Hanley station than cram either a later run or an earlier run on top of it. OK now. For the next schedule change and as more new buses arrive, we need a new line for those who live along Highway 141 going from Gravois up to Olive!!! And we need it to run continously!!! Like I said, the Brown Line (I-44) BRT is an easy build because the stops are already there exept for Kirkwood. In Kirkwood, all I see is a self-service gas station/convience store. Now there is Kirkwood Commons that does have the space needed for a transit center, and it has a hotel and a doughnut shop. That location would be good because hotel guests could walk over to the bus platforms and board the bus they need to get to their destination.